Horse Racing is a very popular sport in the UK for recreational and experience betters. As a matched better, it is well worth having a basic understanding of horse racing given the Horse Racing Refunds offers available. By the end of this guide, you should have enough knowledge to head over to the Refunds article! Note in addition to this guide, if you are an OddsMonkey member, I would recommend reading the OddsMonkey horse racing FAQ guide. How Frequent Is Horse Racing In The UK? There are 10+ major horse racing tracks across the UK, such as Lingfield, Southwell, Ayr, Wolverhampton, Kempton Park, Sandown and many more. Every day of the year at least 3 tracks will be hosting up to 10 races each, providing in total up to 30 UK races every day. Each track will start their racing at around 1pm to 2pm with races running usually every 30 minutes. There is also frequent overseas racing, most notably in the US, that the bookmakers will provide odds for, these run in the UK morning timewise. Which Is The Most Popular Day For Horse Racing? 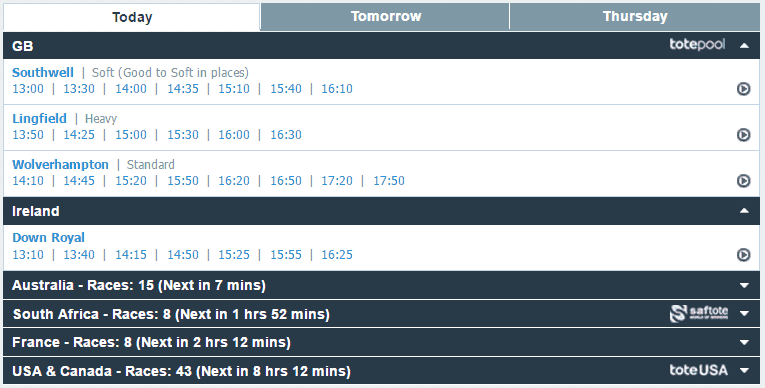 Saturday is the most popular day for horse racing as most people have the day off work! ITV televise racing on Saturday afternoons which is when the best bookmaker offers are available. Usually there will 6 to 9 races televised between around 1pm to 5pm. You may see articles referring to these as 'Channel 4 Racing', this is because Channel 4 had the television rights from 1984 to 2016. When Are The Major UK Racing Festivals? A big thanks to Cheryl from the Team Profit Facebook Group for compiling a spreadsheet with the list of all major racing festivals in 2018. You can download the 2018 Festival spreadsheet here or alternatively check out the Facebook post. The bookmaker will run particularly generous offers during these periods. What Are The Main Type Of Races? This simply means there are no hurdles or fences for the horses to jump over. It's a pure sprint to the finishing line. This simply means there are obstacles for the horses to jump over. These are referred to as 'hurdles' or 'fences'. When 'fences' are the obstacle, the horse race is referred to as a Steeplechase. How Do The Odds Work In Horse Racing? These screenshot are take a few hours before the start of the race. Usually you would be aiming for closer lay odds e.g. 2.0 back and 2.06 lay odds, which is more likely closer to the start of the race. The starting price (SP) is simply the odds of the horse when the race starts. This is determined by the predominately the on-course bookmakers. 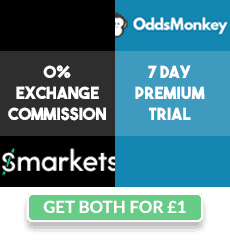 You will be given the option to bet on the Starting Price usually significantly in advance (>24 hours) of a race whilst the bookmakers are deciding on the odds. Do not bet on the starting price! This is because you will not know the actual odds you will receive, meaning it is impossible to place an accurate lay bet. You only need to do Each Way Betting for more advanced Racing offers. However, given you will see it on the bookmaker websites, it's best to give a quick overview! Each way betting is a way to also bet on your horse finishing in the top x places. Usually this will be in the top 2, 3 or 4, depending on the number of horses in the race. However, you receive significantly reduced odds. In terms of how to place an each way bet, when you place a £5 single on Horse A to win, you can also place an additional 'Each Way' bet. This means you are placing an additional £5 on the horse to come in the top 2, 3 or 4 for reduced odds. This gives me a combined stake of £10. This shows that I will receive 1/4 of the odds if Un Prophete comes in the top 2. Therefore, my £5 each way part of the bet, if Un Prophete comes 1st or 2nd, I will be paid at odds of 1.25 (being 2.0 - 1 = 1 to convert to fractional odds, divided by 4 = 0.25, then add back the 1 to convert back to decimal odds). If Un Prophete wins, I win both the £5 single bet (at 2.0 for £5 profit) and the £5 each way bet (at 1.25 for £1.25 profit), for a total profit of £6.25. If Un Prophete finishes second, I lose the £5 single bet (£5 loss) but win the £5 each way bet (for £1.25 profit), for a net loss of £3.75. 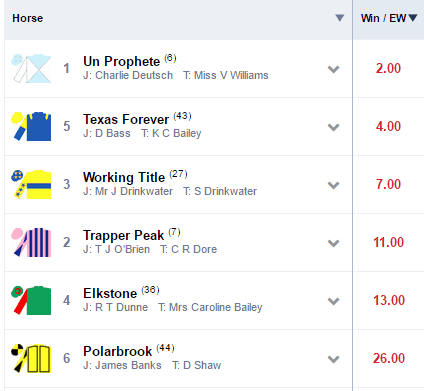 If Un Prophete finishes third or lower, I lose the £10 bet. What Is A Non-Runner and Rule 4? A horse may pull out of the race before it starts. This horse is termed a 'non-runner'. If you have backed a non-runner horse, then your bet is voided on both the bookmaker and the exchange. If there is non-runner after you placed your bet, then the bookmaker will reduce your odds known as the Rule 4 Deduction. Similarly, the exchange will reduce your lay odds by a Reduction Factor. The amount the reduce your odds are fairly similar, so not to worry! For more information on this, I recommend reading this helpful OddsMonkey Rule 4 guide and corresponding spreadsheet. What Bookmaker Offers Are Available? Check out the Horse Racing Refunds article for an explanation of the free bet offers available to you!